There’s something about warm weather that makes me yearn for color. There are a few colors I gravitate towards mainly because they look great on brown skin, they are fuchsia and mustard. In today’s post, I’m sharing how I style this Romper its a recent purchase from Boohoo (see entire Haul Here) and was one of my favorite pieces from the haul. 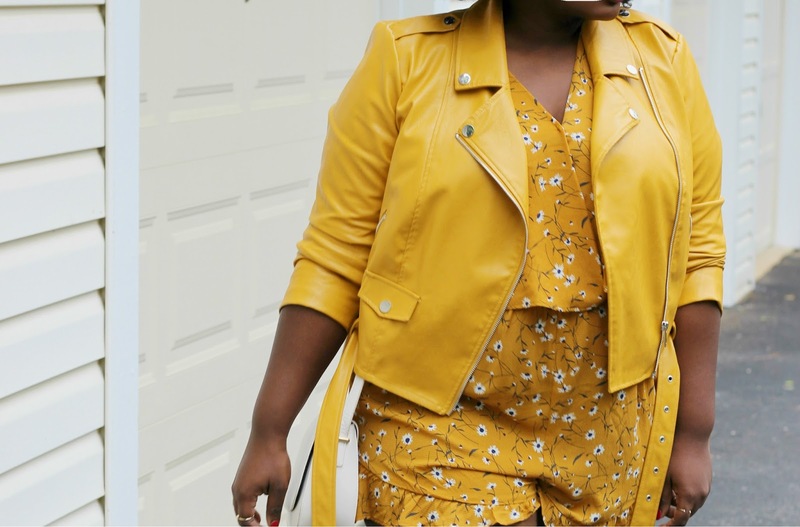 For this look, I decided to pair the Romper with my trusty Mustard moto jacket from Eloquii (also worn here) I literally wore that jacket non-stop when I first got it. Little details like the added touch of a belt and even its somewhat cropped length makes it perfect. The weather here lately has been cool and rainy, If your weather is similar but you can’t wait to wear your summer pieces, this outfit is an example of how it’s done. Because the print on the Romper included white flowers I went with a White crossbody that I scored last year from Forever21 for only ten bucks. I finished up the look with Lace-up flats from Nordstrom and tinted frames from Torrid (aren’t they fun). Diana Stripe Off The Shoulder Playsuit // Jessy Lace Pom Pom Detail Playsuit // Sophia Floral Wrap Playsuit // Alana Slinky Flared Sleeve Tie Playsuit // Bethany Flippy Floral Print Playsuit // Zoey Paisley Print Off The Shoulder PlaysuitTip: Wearing shorts can be tricky when your plus size and bottom heavy a quick tip is to go for “longer” shorts with an a line shape because it will skim your waist. BTW am I the only one who is obsessed with ruffles like these on the bottom of the Romper.BTW this Romper is currently 50% off 😱 which makes it $22 right now and I’m wearing a us 20. Its juniors sizing so you may want to size up at least one size. Are you loving all this talk of styling outfits, sign up for our Newsletter for exclusive content and upcoming happenings also follow this blog on Bloglovin so you never miss a post.